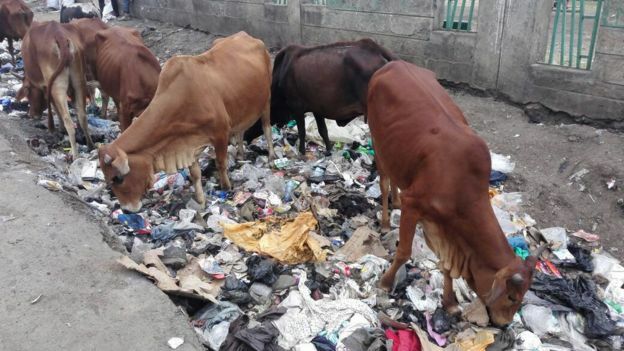 “A ban on plastic carrier bags has come into force in Kenya, which means that anyone found selling, manufacturing or carrying them could face fines of up to $38,000 or prison sentences of up to four years. The government says the ban will help protect the environment. But manufacturers of the bags have argued that 80,000 jobs could be lost. A court on Friday rejected a challenge to the ban. Kenyans are estimated to use 24 million bags a month. Several other African countries have outlawed plastic carrier bags, including Rwanda, Mauritania and Eritrea. Kenya’s ban is seen as one of the toughest in the world, although officials say that for now, ordinary shoppers will be warned and have their bags confiscated. Piles of waste plastic bags are a common site across Kenya, as in many African countries.